In this picture above we’ve sliced the heart. All this red stuff is heart muscle called myocardium and then there’s a membrane surrounding it and we call it the pericardium. The heart chamber is the space inside the heart and that’s normally filled with blood. Of course the heart is inside of a cavity. So of course there is a membrane for that. Remember a serosal (serous) membrane is the type that doesn’t lead to an opening and they contain parietal and visceral membranes. The myocardium is lined with simple squamous epithelium on the inside called the endocardium. On the outside there is an epicardium which happens to be the visceral layer of that serosa, because its covering the organ, and because it’s a serosa, it’s continuous with another layer and what would that other layer be? Parietal layer! 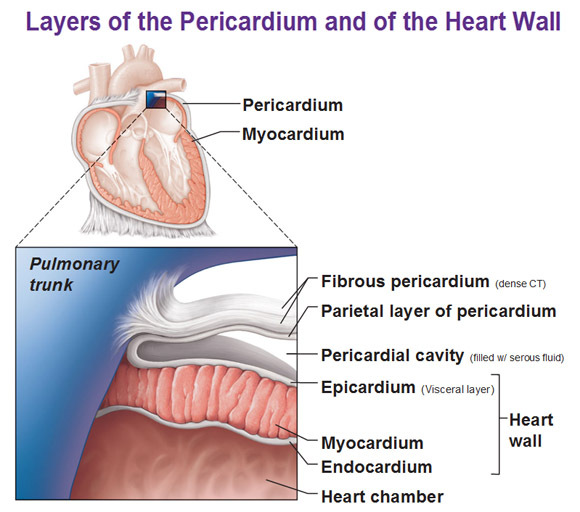 And of course in between the visceral and parietal layers, we have a space full of serous fluid called the pericardial cavity. So you notice a theme? Visceral, parietal, with a potential space in between with a film of fluid. Here in this particular case we’re going to fuse an outer layer with this parietal layer, and notice it’s a thicker layer called a fibrous pericardium made of dense connective tissue to help keep it contained. There’s a lot of action and force and pressure that goes on with the heart in this little space so it to has an extra dense layer so that it doesn’t explode. This way it is able to pump and move all that stuff but it’s kept in place and anchored, which is what the fibrous pericardium is for. 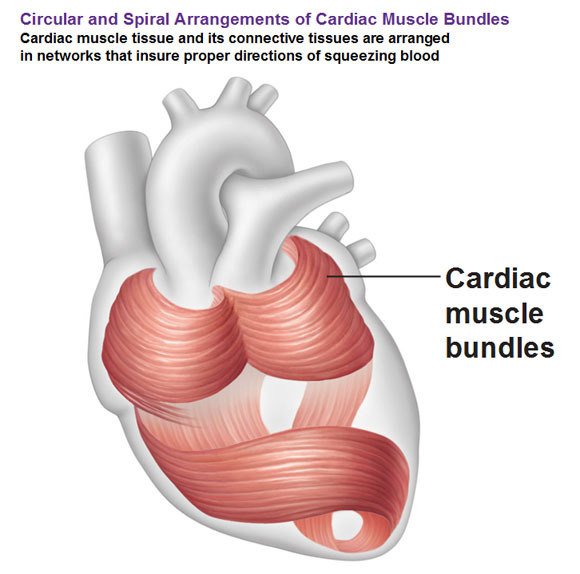 Next, you could see the overall arrangement of the cardiac muscle fibers, as far as the direction of the fibers goes. They are kind of like skeletal muscle fibers, they’re going to be kind of longish, kind of thin, so you can lay them down kind of parallel but instead of… say a bicep that runs all in one straight direction that helps you function, we have this spiraling thing going on. You could see spirals in the upper part and in the bottom 2/3rds it’s a bit more complex. This is so that the heart pumps the blood in the right direction. It goes from the upper chamber to the bottom chamber and then from the bottom to the top. With the spiral shape, there is a sort of twisting motion, similar to wringing a washcloth so you don’t leave any blood behind. The body always wants to be efficient so it helps wring the blood.